Note 5 might end up with a graphics processor designed entirely by Samsung, if the rumors out of Korea hold water. The company is currently making its own Exynos line of chipsets that are based on ARM architecture like most mobile processors out there, but the graphics number-crunching is done by ARM's own Mali family without much tampering. Qualcomm, for instance, which makes the ultrapopular Snapdragon mobile family of chipsets, uses a tailor-made Adreno GPU units in them, which are with a design of its own, thus having much more control over their thermal efficiency and performance ratio. Samsung, however, intends to be ready with its own mobile GPU piece by mid-2015, and put it in the next edition of the Exynos line for a system-on-a-chip done completely in-house. This means that we might see an all-new Exynos in the eventual Note 5, and we can't wait for more leaks and, hopefully, benchmarks, of Samsung's rumored homebrew GPU to pop up. will be interesting for sure. but then again to my knowledge both ARM and Imagination did not license their IP. they just license their design. Qualcomm was capable of making their own GPU because of the IP they bought from AMD years ago. even nvidia haven't license their IP in the mobile. they say they will license K1 design but not their GPU IP. they did license their IP to intel but it happen very long time ago. (if samsung did license nvidia stuff then nvidia will not filing lawsuit in september against samsung) right now it is impossible to built new GPU without infringing existing patent that already own by some of these GPU maker. maybe this is one of the reason why nvidia go after samsung as well. All I read was a retarded comment by you. yeah... but lets us not leave the ignorance cloude the judgement here, in todays world everybody copies, to me the iphone 6 plus is a copy of the note lineup. Technically nVIDIA is going after ALL of the mobile GPU IP holders = ARM, Qualcomm and ImgTec (PowerVR) but yeah the money is with Samsung so they're the fall guy in nVIDIA's own opinion. not really. nvidia go after company that actually make the chip. if nvidia in the totally wrong side about their claim ARM and Imagination Technology would outright deny about their GPU design infringing nvidia IP. instead ARM refuse not to comment anything and IMG only spoke once that they believe their GPU technology is unique and well protected. Samsung:" after years of fabrication with ARM, Apple, Qualcomm i confident that we finally know how to made a GPU.! 1st , lets put a name for it. Mali graphics is good enough. But the new Samsung GPU is quite interesting to see. FYI Adreno wasn't designed by Qualcomm, it was originally developed by ATI and sold to AMD when they acquired ATi, the whole division was then later sold to Qualcomm. The original ATi Imageon shader pipeline and microcode can still be found to this date in modern Adreno GPUs. I think they should continue investing in Exynos chipset. Its pretty good combo. At least Samsung is trying to design something. Exynos has been nothing special for a long time. Stock ARM cores with Stock ARM Mali GPU. Straight off-the-shelf internals. With Qualcomm ditching custom cores next year, and rolling lazy with Stock ARM CPUs: Samsung has a chance to actually catch up architecturally for the first time since dual core configurations. Adding a custom GPU to compete with Adreno certainly can't hurt. Although the new Mali GPUs are plenty powerful enough already. I'd much prefer that Samsung work on a CPU core that doesn't log jam and stutter when too much is going on by following Nvidia and Apple's example and designing a big, powerful, custom core that prioritizes snap performance. 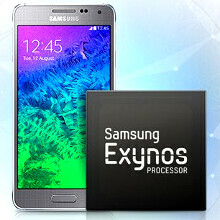 And hopefully we'll start seeing Samsung devices in the US with Exynos processors again.